"A steeply pitched gable roof and central entrance tower characterize this one room red brick Gothic Revival building. The building is erected on a limestone foundation with common brick walls laid with 7th course headers. Many of the original interior features have been retained including a multi-colored tile floor, gold leaf detailing on the walls and ceilings and the altar with its intricately hand-carved wooden relief reredos. "Rev. 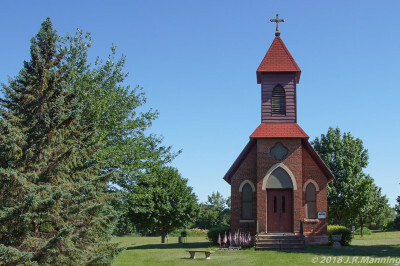 John Metzler of Sacred Heart Catholic Parish commissioned the construction of the chapel in 1896 in the memory of Rev. Joseph Boehm. Sacred Heart is located at 418 Dewey Street, and was founded by sixty German-speaking families in 1875. Masses were held periodically in the chapel through 1943 at which time the building fell into disrepair until the parish undertook restoration efforts in 1982. Today, the chapel is used periodically for various services and gatherings"